Haters Gonna Hate. Proverbs Nine Eight. rebuke the wise and they will love you.” – Proverbs 9:8. I have this problem. Well I have many problems. But I have this one in particular where I like to tell people what to do and what to think. It stems from this belief that I am pretty smart and that means people should really take my advice. Now there is nothing wrong with dolling out some sound advice. Even some un-sound advice is okay to give out. The problem really lies in the delivery and the audience. That is usually where my problem lies. My audience, usually is not super impressed with my advice. I like to pick the ones who are stubborn and I like to pick the times when they are unwavering. I seem to deliver it with the worst possible tone, an air of arrogance, that makes them put their guards up. I like to learn. I love to discuss. I even tend to argue. The exchange of ideas is an amazing thing. 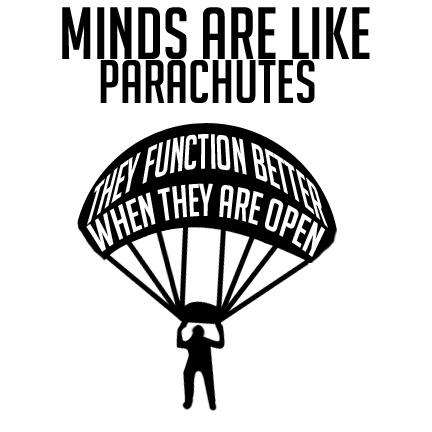 Minds are like parachutes, they work the best when they are open. I have to start finding some open minds, and I have to start opening mine more often. There are a couple of seminars, summits, and power lunches happening in the area. Part of me wants to go and they other part of me somehow feels like if I go I am admitting that I need help. That my advice is not good enough as I have to rely on the words of others. I have to change my attitude about advice if I want anyone to start accepting mine. You see athletes have coaches. Now when you are little you need one to teach you the game and set up drills so you know how to play. But even the top athletes have coaches. These athletes know the game, sometimes better than their coaches. They know what drills need to be done. They can really almost coach themselves. Almost. Even the best need an encourager. Even the greatest need to hear and see from a different vantage point. I hope that I can fix my problem and start realizing that when I want to discuss, argue, and advise I need to be around people who have open minds. And I need to make sure mine is deployed as well.